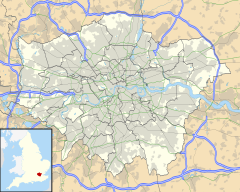 Lower Clapton /ˈklæptən/ is a district of East London in the London Borough of Hackney, lying immediately north of Hackney Central, the borough's administrative and retail centre. Lower Clapton's unusual Round Chapel. Built in 1869–71 as a Congregational church, it is now an arts centre. It is considered to be one of the finest non-conformist buildings in London. Lower Clapton can be described as closely approximating to the southern part of the E5 (Clapton) postal district. North: Lea Bridge Road\Kenninghall Road. Upper Clapton lies north of these roads. Manorial courts from the early 19th century distinguished the parts of Clapton north and south of Lea Bridge Road as Upper and Lower Clapton, and those names soon passed into general use. West: The Rectory Road to Hackney Downs rail line (though both stations are just outside Clapton), taking in Hackney Downs park. South: The southern boundary approximates to Clifden Road. As described, the settlement emerged along the way which in 1745 was called Hackney Lane, part of which ran through Broad (later Clapton) Common. Building spread to meet streets east of the high road and north of Homerton in the 19th century. Manorial courts (the Manor of Lordship) from the early 19th century distinguished the parts north and south of Lea Bridge Road as Upper and Lower Clapton, and those names soon passed into general use. Hackney Lane came to be known as Lower and Upper Clapton roads, until in the late 19th century the stretch through the common to Stamford Hill was named Clapton Common. Lower Clapton is centred on Lower Clapton Road, to the north of which is Clapton Pond, the remnant of the old village green. Clapton Pond and the late Georgian Clapton Square are the area's two major conservation zones. Clapton Square is an attractive Conservation area which includes historic Georgian terraces facing onto the parkland in the centre of the Square. Hackney Downs, one of the larger open spaces in Hackney, is formally within this district, though many people consider the Downs to be an area of Hackney in its own right. Lower Clapton has a relatively large amount of green space for a district of inner London. In addition to Hackney Downs, the area is bordered by Millfields Park, Clapton Park, and Hackney Marshes. Large parts of Lower Clapton look much as they did when the area was first developed in the second half of the 19th century. Most of the housing stock consists of Victorian terraces of various sizes. Several highrise LPS constructions erected by the Council in the late 1960s and early 1970s were demolished in the 1990s to make way for lowrise Local Authority housing, e.g. the Clapton Park Estate. Like many other parts of East London, Lower Clapton is socially diverse and multicultural. Chatsworth Road, which had a regular market until the 1990s, still provides many amenities for people who live in the area. A new Sunday market has been established there since December 2010. The shops and restaurants on Chatsworth Road reflect the diversity of the surrounding streets – offering African, Turkish, Asian and Caribbean produce alongside butchers, bakers and greengrocers. More recent additions include a creperie, coffee shops and a French delicatessen, part of the area's vaunted gentrification in the lead-up to the 2012 Olympic Games. As of 2014, Lower Clapton is represented by five separate electoral wards. Each of these wards straddles the boundaries between Lower Clapton and its neighbours. A map showing the Clapton Park ward of Hackney Metropolitan Borough as it appeared in 1916. Lower Clapton is split between two parliamentary constituencies: Hackney North and Stoke Newington, and Hackney South and Shoreditch. Notable residents have included John Howard, Nathaniel Woodard who was a curate of St. John's, Harold Pinter, Helen Shapiro and Jessica Tandy. A number of shootings that took place in the 1990s and early 2000s on Upper and Lower Clapton Road earned the locality the nickname "Murder Mile". During the 2011 England riots, Clarence Road, near the epicentre of the rioting, was the site of Pauline Pearce's Heroine of Hackney speech. For further details of education in Lower Clapton, see List of schools in the London Borough of Hackney. Hackney Downs (on the edge of the Hackney Central and Dalston areas). ^ "London Places" (PDF). Greater London Authority. GLA. Archived from the original (PDF) on 6 September 2015. Retrieved 11 October 2015. ^ 'Hackney: Clapton', A History of the County of Middlesex. 10. 1995. pp. 44–51. Retrieved 17 May 2011. ^ Thompson, Tony (22 April 2001). "Two more die on 'murder mile'". The Guardian. Retrieved 17 May 2011. ^ Kenny, Ursula. "Ursula Kenny on how Anna Hassan turned around Millfields primary school in Hackney". the Guardian. Retrieved 2 September 2015.